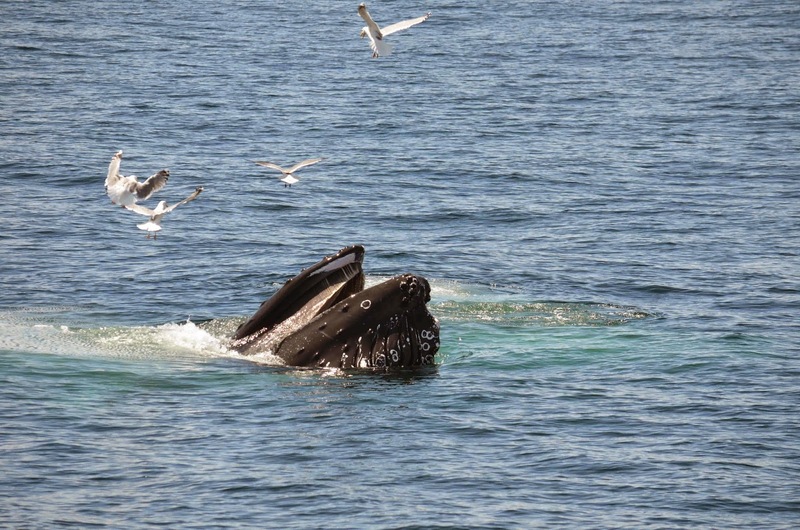 This morning on board the Cetacea we had a species packed trip. We started the trip at the northwest corner but didn’t see anything despite the beautiful weather. We continued south and saw lots and lots of bird life but still no whales. Near the middle of the bank we spotted what we thought could be dolphins but actually turned out to be a group of three harbor porpoises! Porpoises are the smallest whale we get in New England, only getting up to 5 feet long. Its relatively unusual to see porpoises out on Stellwagen so it was a very nice sighting. In the same area there must have been something going on because we also spotted a huge grey seal and a harbor seal popped up right next to the boat. 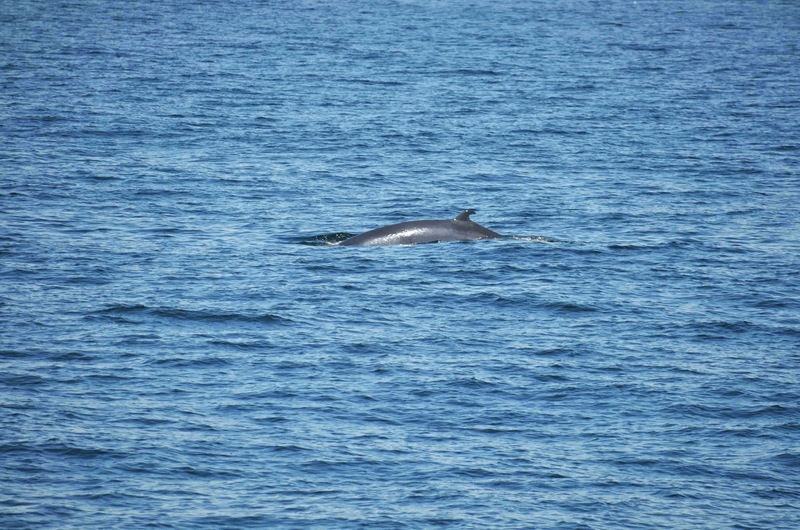 Then a minke whale crossed out bow and gave such good looks that I even managed to get a photograph of it. But still no big whales! 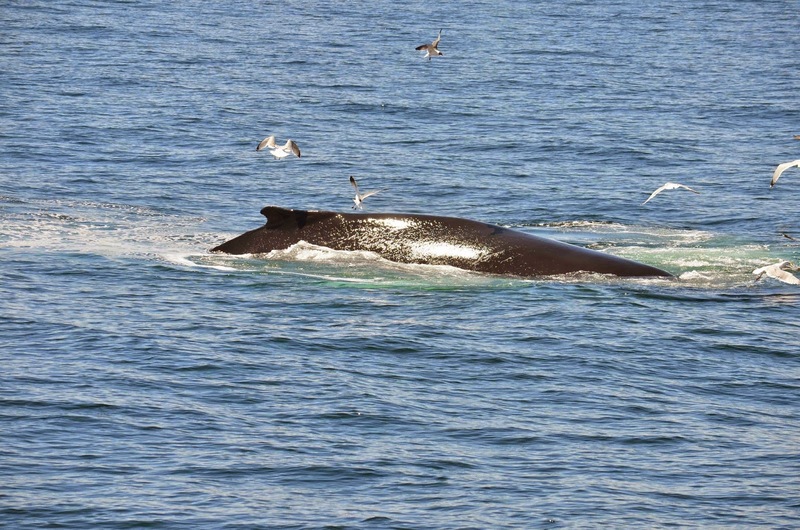 We kept going south and soon spotted a blow which turned out to be a humpback. This what was taking 4 minute dives and would surface once and then dive again. So frustrating! We managed to id the whale as Pepper but still couldn’t get good looks. Just as we were about to turn back to Boston, Pepper started bubble feeding near the boat! We had great looks at Pepper straining fish out of the water while gulls circled trying to steal a leftover! It was a great sighting, and a great day overall.